While many observant Jews still refrain from eating pork, more and more cultural - and even practicing Jews - Jews freely indulge. What was once an illicit meat consumed with shame is now no longer treif (Yiddish for non-kosher) for these Jews, particularly ones who congregate at farmers' markets instead of synagogues come Saturday morning. Today the writer and chef takes that love even further. Adler and Pollan act as standard-bearers for a growing tribe of progressive American — not to mention Israeli — Jews now unburdened by the ancient pork prohibition that so dogged their ancestors. While many observant Jews still refrain from eating pork, more and more cultural – and even practicing Jews – freely indulge. What was once an illicit meat consumed with shame is now no longer treif (Yiddish for non-kosher) for these Jews, particularly ones who congregate at farmers’ markets instead of synagogues come Saturday morning. Pigs are by far the most efficient meat animal to husband year-round in New England, says nose-to-tail butcher and artist Jake Levin, who had a leftist, anti-religious Jewish upbringing in the Berkshires. Since pigs don’t chew the cud — the very characteristic that makes the otherwise cloven-hooved beast not kosher in Deuteronomy — they don’t require the acreage that herbivores like cows and sheep do. They’re also more cold-hardy than chickens, which must be housed indoors come winter. Finally, omnivorous pigs thrive on post-consumer food scraps and agricultural waste products — think rotting apples on an orchard or the whey generated by a dairy making cheese — a cheap and often free source of feed that only enhances the deliciousness of the resulting meat. For Levin, in fact, an irreverent joke about the “kosher pork” he cut with other Jewish butchers at Fleisher’s Grassfed Meats in Kingston, N.Y., morphed into art. The process of creating this experimental documentary for a larger installation called the “Messianic Pig” ironically gave Levin newfound respect for the cultural, historical and spiritual reasons Jews still maintain the traditional dietary laws. So while many Jews may be redefining their relationship with kosher eating ”“ and especially pork ”“ there are of course plenty of forward-thinking ones still holding fast. 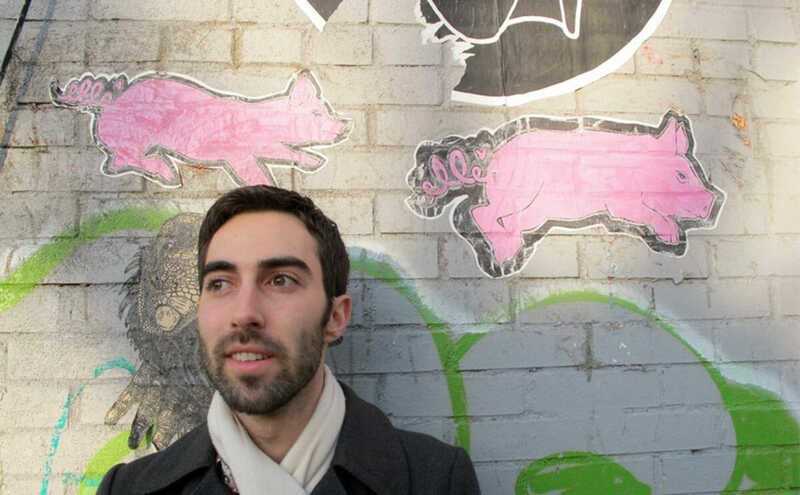 That’s true for Yoskowitz, the grandson of Holocaust survivors, who worked on a pig farm in Israel after college in 2007 and is writing a book navigating the rise of an Israeli pork industry amid the persistence of the Jewish — and Muslim — taboo. (He can now find pork on the menu of all the fine-dining restaurants in Tel Aviv, where there was next to none just 20 years ago.) Even Reform Jews who grew up in ham-eating households are reconsidering their relationship with pork, sometimes choosing to abstain as adults, to renew their connection and commitment to Judaism. So potato latkes fried in lard, “pigstrami” (pastrami-style pork belly) and bacon-wrapped matzo balls still aren’t your thing? No worries. Levin, for one, recommends trying a surprisingly ham-like “sham,” a brined and smoked leg of mutton. Dry-aged meat from mature sheep, he says, is his latest obsession — second only to pork. This signature dish appears near the end of Tamar Adler’s inspiring An Everlasting Meal: Cooking with Economy and Grace (Scribner, 2011). She writes: “This slow-cooked meat dish must be one of the most delicious things ever made from any of the ingredients in it. The cooked milk separates into golden curds, which look strange and taste divine.” After just trying the recipe, I concur. The pork shoulder will probably come tied. Leave it tied for cooking. The day before you plan to cook it, salt the roast five times as heavily as you want. Heat the oven to 325 degrees. Heat a deep oven-safe pot, then add the olive oil and half the butter. When the butter stops foaming, add the pork and let it get brown on all sides. It can take up to 5 minutes per side. Remove the pork from the pan. Warm the garlic, savory, sage, bay leaf, and lemon zest in the remaining butter in the same pot for a few minutes. Return the pork to the pan, add 1½ cups milk, and bring to a boil. Reduce it to a simmer, partially cover, and put the pot in the oven. Check the pork every half hour, turning it occasionally. As the milk evaporates, add more by the ladleful. As the pork cooks and the milk reduces, the milk will start to caramelize into golden curds. Let it cook for 4 to 5 hours until it is tender and the liquid is a golden tan, reduced juice. Unimaginable amounts of fat will rise to the top of this while it cooks – there is fat in the pig and fat in the milk. Skim it off if you’re eating this immediately. If you’re cooking it ahead, cool the pork in the refrigerator covered with the layer of fat until the day you want to serve it, then remove the fat in pieces. Reheat the pork at 300 degrees until warm. If the curds of milk aren’t richly brown, remove the pork and set it aside, then let the milk continue cooking over low heat on the stove, letting the curds caramelize further. Turn off the heat and return the pork to the pot.